On our way back from Queens, and a quick stop at our favorite Filipino restaurant, we made a stop at Güllüoglu Baklava. I was previously unaware of this fantastic Turkish cafe that serves no less than 12 different kinds of baklava, apparently for more than 130 years in Istanbul. We got a few mini portions of fistikli baklava (pistachio baklava) and a piece of ekmek kadayifi (bread sponge cake with syrup). I much preferred the baklava and would pass next time on the sponge cake. 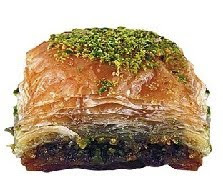 But I need to go back because I was told they also serve the best ispanakli su boregi (spinach pie) in New York.